In the last episode of Podcastification I gave you my best tips on getting that ideal podcast guest to say “Yes” to your invitation to be your show. Today I’m going to take you to the next step. What do you do once a guest has agreed to be on your show? Are there things you can do to help them prepare, make the most of the opportunity, and get the best recording possible? On this episode we’ll be covering a TON of helpful things you can do to make the guest at home on your show, ready to give their best, and able to help YOU promote and publicize it powerfully. [2:43] Step 1: Get the info you need to make it a great interview. 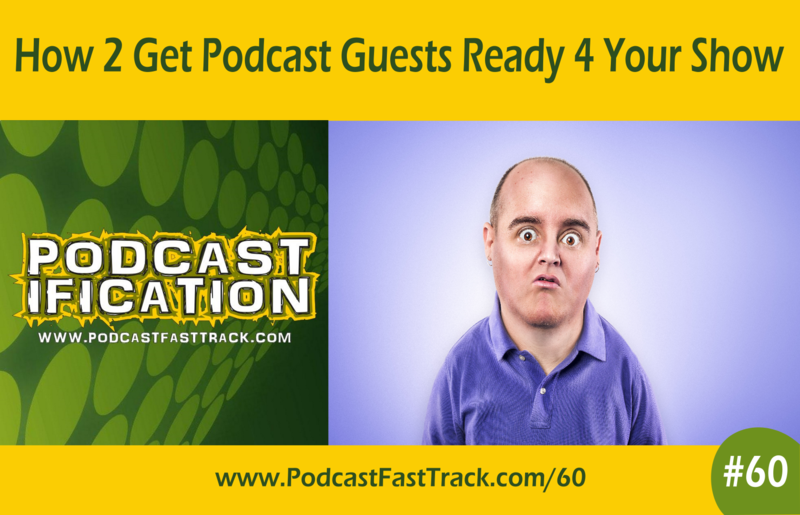 Your podcast guest is just that - YOUR GUEST. You need to practice some good old fashioned hospitality and help them do their very best on your show. It’s your responsibility to bring out the great value they can deliver to your audience - and that starts with helping them to help you as you prepare for the conversation. This episode has some very practical tips and tools to help you set up an efficient system that enables your guest to EASILY give you the info you need and set the stage for a great interview and a powerful promotional effort on both your parts. [6:49] The kinds of things you NEED from your podcast guest (stuff to ask for). [15:38] What kind of instructions does your podcast guest need? Whether your podcast guest has ever been interviewed for a podcast before or not, they’ve never been on YOUR show before, right? You have particular things you do and specific things you’re looking to get out of your interviewees - and your guest knows nothing about those. On this episode I’m going to help you think through the things your guest needs to know in order to bring their A-game to your conversation, optimize their side of the recording for great audio, and make it an enjoyable and valuable experience for your listeners. [19:18] Why it’s good to provide your podcast guests with a “best practice” sheet. It’s a great idea to provide your podcast guests with a sheet of some kind that they can keep for easy reference that tells them the best practices for being on your show. What sort of things should go on that list? Here’s a short-list: and you can hear them broken down in detail on this episode of Podcastification. Emphasize that you want to promote them in best light possible. Tell them you will go over some of this again briefly when you connect. Ask them to plan to record in a quiet setting with a low amount of echo. Encourage them to be mindful of sitting still (no activity, driving, treadmill). Let them know to use a hard-wired computer connection (not wifi). Emphasize that they need to use an external mic. Here are my recommendations in order of preference: USB microphone, USB headset, earbud microphone. Stress that they must wear headphones, earbuds. Ask them to turn off all external speakers from computer (and other noisemakers).